I also wanna say a personal word to each and every fan. You’ve been with me every step of the way—through all my ups, all my downs. I have never, never have and I never will, take you for granted. I love you with all my heart. Thank you so much. Thank you God for giving us life and the ability to embody goodness. With God, all is possible and all is good. And I just, I wanna thank my baby, my beautiful son. He wakes me up every single morning singing his own little melodies. He’s only 2, you guys. And I want you to know you are my heart. You are my life. And you have shown me the meaning of real unconditional love. Mumma loves you, Eissa, ra–ra–ra! 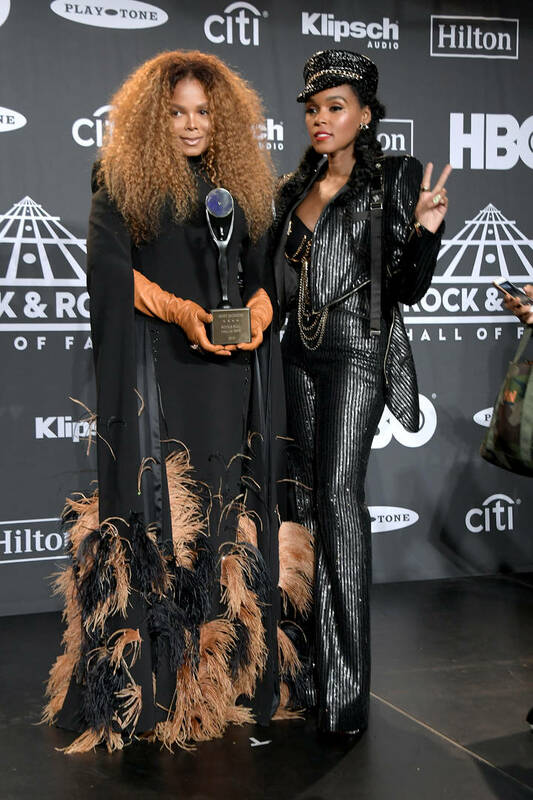 And Rock & Roll Hall of Fame, please, 2020: induct more women. Thank you so much for this honor. I love you so much. Thank you. Janelle Monaé had the honor of introducing Jackson, an icon and one of Monaé’s idols who she called the “legendary queen of black girl magic.” Monaé took the audience through a history of Jackson’s albums, reminding them of the cultural impact of records such as Control and Rhythm Nation.